This amazing cauliflower salad calls for a bit of a twist. You roast the cauliflower before adding the vinaigrette. I really think that once you try it, this cauliflower salad will be as much a favorite of yours as it is mine. 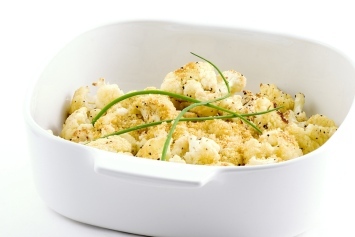 In a large bowl, toss cauliflower with 1 tablespoon of oil, thyme and half of the salt. Spread the mixture on large a baking sheet. Bake at 400ºF for 25 to 30 minutes or until cauliflower is lightly browned. In a small bowl, whisk together vinegar, lemon juice, mustard, the rest of the salt and the oil. Pour the dressing over cauliflower and toss gently. Sprinkle with chives and serve at room temperature. Roasting the cauliflower gives it a rich nutty flavor and the dressing you add is both tart and savory with a little bit of mustard and herbs. Cauliflower is a very healthy vegetable to eat. It is part of the same family of foods as broccoli, Brussels Sprouts and cabbage. To find information about why these vegetables should be part of your diet often look here. This is a fabulous diabetic recipe. It is very low in carbs per serving and as I said above, a very healthy vegetable recipe. Add this to your repertoire of healthy diabetes recipes. This is a very healthy recipe. You can even omit the little bit of honey if you prefer, but it is still healthy with it included. Look here for the rest of our tasty vegetable recipes. All are as delicious as this cauliflower salad recipe.